The Leopold Museum is a recent art museum in Vienna, opened in 2001. 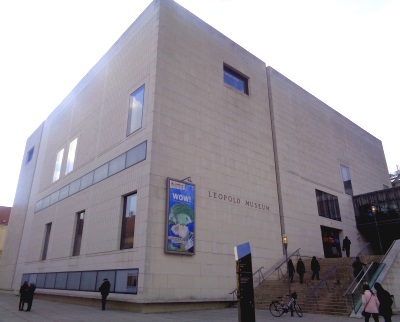 The Leopold Museum is located in the city centre in the new Museumsquartier (museum area of Vienna) The Leopold Museum exhibits paintings from the private collection of Rudolf Leopold, an ophthalmologist and art collector (born 1925 in Vienna, died 2010 also in Vienna). Also worth seeing is the new, bright and modern building of the museum. Many highlights in the exhibition are by two artists. On the one hand there are many works by the painter Eugen Schiele (Austrians, 1890 to 1918, Expressionism). On the other hand, one can see art by Gustav Klimt (from Vienna, 1865 to 1918, Jugendstil) in the Leopold Museum. Of course you can also admire great paintings by other painters. Most of them are by Austrian artists and modern works of art. A normal admission ticket to the Leopold Collection costs 13 euros. There are various discounts, for example for children, students and seniors (8 Euro to 9.50 Euro). Tipp: With the great Vienna Pass you can visit the Museum Leopold Wien for free. The museum is open every day of the week from 10 a.m. to 6 p.m. with two exceptions. Tuesday is rest day, Thursday there are longer opening hours from 10 o’clock to 21 o’clock. As far as we know, the Leopold Museum is otherwise only closed on Christmas Eve (24.12.). The Leopold Collection is part of the Museum Quarter of Vienna. Almost directly opposite is the Museum for Modern Art „mumok“. Several important museums are next door (e.g. Museum Moderner Kunst and Kunsthalle Wien). The famous Natural History Museum Vienna is barely more than 100 metres away. 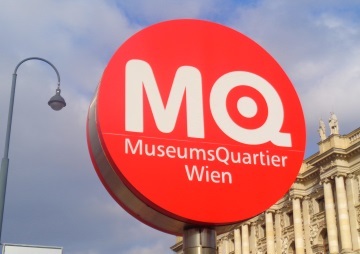 The Vienna Pass (more information) is valid in all museums mentioned.